The QMS consists of 8 executive procedures, 450+ formats, 50+ files, 30+ lists, 16+ process maps, 45+ registers, 6+ schedules, 30+ standard guidelines, 60+ standard operating procedures, 150+ standard test procedures, 30+ standard work instructions etc. Our QMS complies with the requirements of ISO 9001, ISO/TS 16949, ISO/IEC 17025, ISO 140001, BSOHSAS 180001, AS 9100 and Nadcap standards. It goes beyond ISO guidelines and addresses the needs, requirements, concerns & expectations of customers, staff, subcontractors, suppliers, investors, regulations and the society. We plan to get the Nadcap accreditation shortly. However, we would like to state that the nature & uniqueness of most of the tests & tasks we perform and projects undertaken makes it difficult to include them under the scope of accreditation. Accreditation schemes require mandatory participation in inter- laboratory testing programs which is a difficult proposition at present (since most of the services are not undertaken by other labs). In view of this, every process, test and measurement is performed as per documented procedures (based on ASTM, BIS, DIN, IEC, ISO, JIS, MIL & others) and practices traceable to international/ national standards. Every equipment, instrument & measure is calibrated at specified intervals as per schedule to ensure reliability of results & traceablility of measurements. We are a detail oriented company. Every enquiry/ communication is documented and responded/ acknowledged within hours. All customer properties, test items etc. are assigned unique identification throughout. Every task, measurement and process is documented ensuring transparency with regard to identification, date, time, procedure, results, responsibility etc. We are after achieving zero non- compliance, zero delay, zero error, zero re-work, zero complaint, zero pollution, zero accident, zero hazard and zero waste in every task & process. 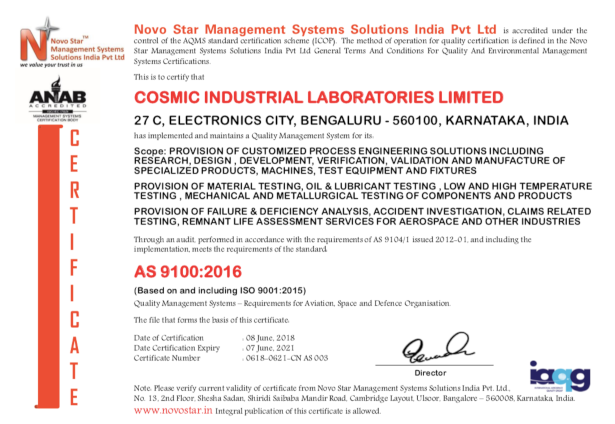 COSMIC is an AS 9100:2016 and ISO 9001:2015 Certified Company. Please see below for the certificate. 2014 © Cosmic. ALL Rights Reserved.